This stitch hits all the right notes for me. It's not too big and it's not too small. It blends in perfectly and adds a sassy little look to a sky. I present the Beetle Stitch in sky form! As with other sky diagrams this month, two colors are used for clarity. The stitched sample on Instagram illustrates a single matte thread. Another scenario is alternating a matte and light metallic in the same color value, as diagrammed in contrasting lines above. The overall thread weight determines how much attention the area receives. I just love this stitch. And I'm ashamed the piece I'm using it on isn't done yet. It's one of those that is so close it should be done. Shame on me! I'm going to go finish it now. 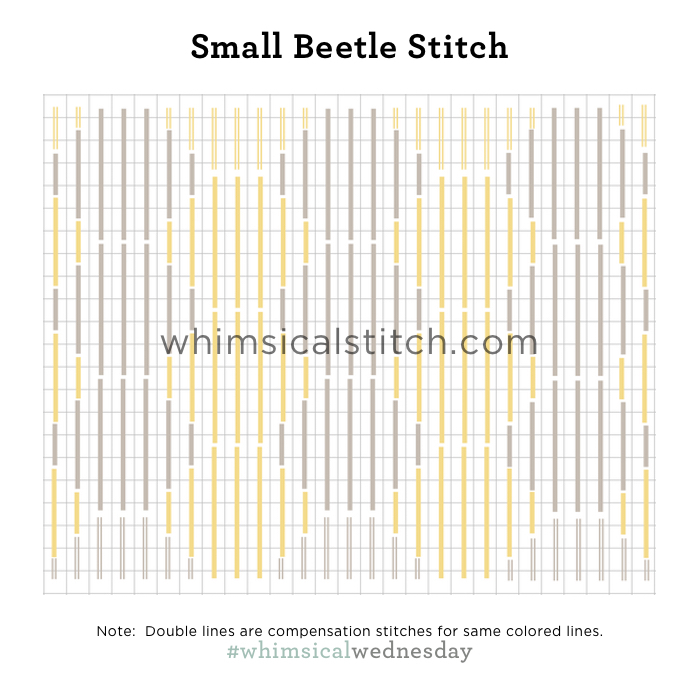 And maybe write a stitch guide for it.